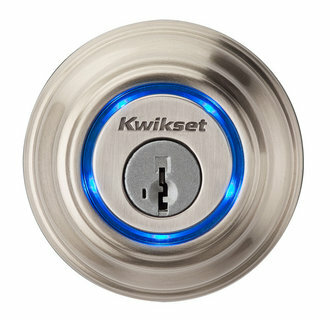 Kwikset’s newest product to make life easier is finally here to pre-order today. Kevo blends technology with problem solving into one of the greatest deadbolts on the market. With the simple touch of your finger with a compatible Smartphone in your pocket, purse or hand, you can easily unlock the deadbolt. If you don’t have a Smartphone, the lock can just as easily be operated via the included Key Fob. Additional Key Fobs are also available (purchased separately – 926 KEVO FOB). Using the Kevo Mobile App, you can easily send an electronic key (eKey) to family, friends, or visitors who have a compatible Smartphone. Make these keys temporary or permanent to maximize flexibility and security. Adding, deleting and disabling eKeys is quick and easy and there’s even a Lost Phone Reset should the unthinkable happen. The Kevo lock comes with 2 eKeys out of the box and additional eKeys can be purchased via the Mobile app for $1.99 each. This entry was posted in Deadbolts on October 28, 2013 by Home Improvment.